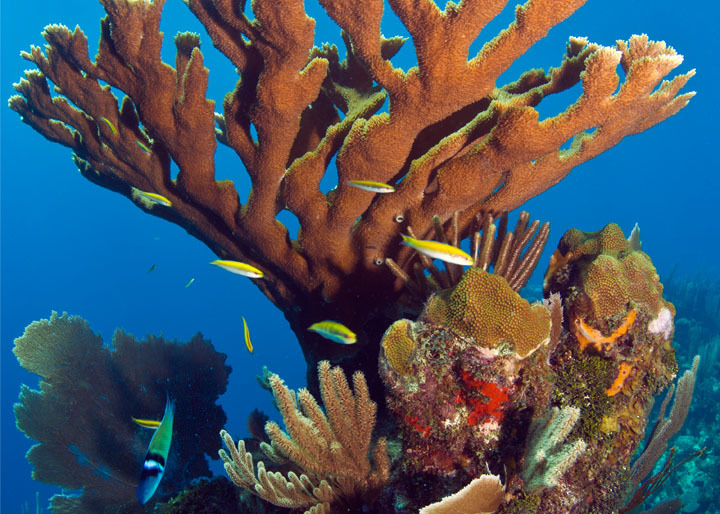 The coral reefs of the Caribbean support a rich biodiversity and are central to the identity, wellbeing and economic prosperity of the people of the Caribbean. However, like all reefs worldwide, Caribbean coral reefs are under unprecedented pressure from unsustainable fishing, pollution and coastal development. Combined with global climate change and ocean acidification, this poses a serious threat to these iconic marine ecosystems. Understanding these risks, and developing strategies to deal with them, is crucial to the sustainable development of the Caribbean region. Reducing local pressures is a key strategy for increasing the resilience of coral reefs to climate change. The Australia Caribbean Coral Reef Collaboration brings together coral reef managers and policymakers from different sides of the planet to share expertise and knowledge, to explore new ideas and to initiate joint projects that can help improve the outlook for Caribbean coral reefs in the face of climate change. The Australian Government is providing support through the Agency for International Development (AusAID). Implementation is being led by Great Barrier Reef Marine Park Authority in partnership with the Caribbean Community Climate Change Centre (the 5Cs) under the auspices of the Caribbean Community Secretariat (CARICOM). In the face of climate change, local, national and regional efforts to strengthen the resilience of coral reefs have never been more important. The Australia Caribbean Coral Reef Collaboration aims to develop and test practical measures that coral reef managers and policymakers can deploy for real-world outcomes. A Regional Plan of Action will present strategies and programs to help national governments and regional organisations build the resilience of Caribbean reefs. Five collaborative projects are being implemented to address five priority issues: biodiversity offsets, integrating the human dimension into reef conservation, outlook reporting for integrated planning, reef health assessment tools and reef stewardship.